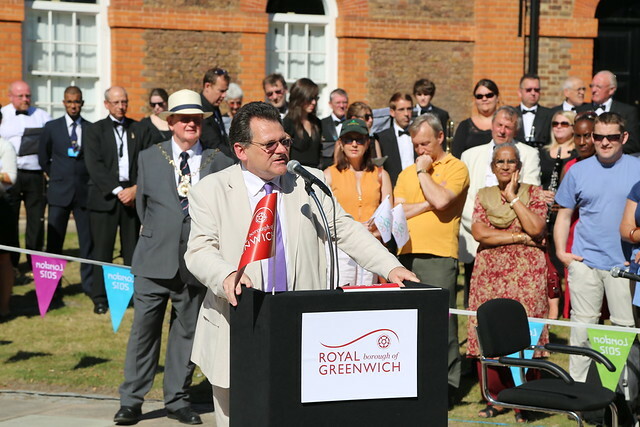 What were your personal highlights from this incredible year in Greenwich? It is difficult to pick one thing because it has been such a phenomenal year, one we'll never see the like of again. If I pick a Royal one and an Olympic one: For the Royal one, I think it would be actually bringing the charter in to the town hall. When we came back, the Mayor and I, we brought the Letters Patent in to the town hall and all the staff were around the balconies and standing in the Victoria Hall and all of a sudden starting clapping and cheering, which is unusual for the leader of the council to receive! All around that royal weekend was a great highlight. On the Olympic side, it has to be Gemma [Gibbons] winning her medal. Particularly having set up the Starting Blocks charity and knowing that we funded her and she asked for additional help just a two or three months before the games. She'd lost her ranking through injury and the way to get it back was to compete in tournaments which were in Singapore or Thailand. But she had would have had to pay for that herself and the Greenwich Starting Blocks charity paid for her to go. Actually seeing one of our own, in every sense of the word, and in such an iconic moment for the rest of the country. The Games themselves seemed to go very smoothly. Did you expect at the start of the year that it would have gone as well as it appeared to and was it as smooth as it looked? It actually did go as smoothly as it looked, yeah. If you take the Olympic arrangements, we had teams of staff working in three shifts, twenty-four hours a day, and we had to report to Government about 4am so the Prime Minister could get a national briefing at about 6 or 7. We had to collate the responses from other boroughs in south east London, everything from terrorist threats to anything that might impede the smooth flow of the Olympics. They do this traffic light system and you started query it when everything appeared to be green on every day and you think, "are we sure?" As you got more and more in to it, it just ran really smoothly. And you were satisfied with the council's response to the concerns from Greenwich town centre businesses during the Games? Yeah, but I think you can tell from the nature of an event who will potentially gain and who might not and the lesson from other areas that have had successful games like Barcelona and Sydney is how you capture the tourism in future years. That's why it's with great relief that Greewich Hospital have abandoned plans to knock down the centre of Greenwich when we want to be saying to the tourists, "now come back." Obviously you were against the redevelopment of the market but they were promising a very high quality hotel for Greenwich. Is it a loss to the town that there won't now be that hotel? I regret the loss of any hotel and yeah, that did look like an interesting one because we do need more hotel spaces, particularly to change the nature of the tourism. But in terms of which bit of Greenwich town centre you need to improve, it isn't the market. If every shop was like the inside of Greenwich market you'd be saying it was a nicer place. So it's not the place to start. We've started to talk to the new Director [of Greenwich Hospital] about things we can do jointly where everyone agrees there needs to be some improvement. Do you think there's anything to learn from the part-pedestrianisation during the Olympics and has it put it back on the agenda for the town centre? I think we should continue to look to see if there's better ways to manage the traffic which I don't think means a pedestrianisation scheme at the moment. Someone [an outside contractor] has looked to see if there's a better way to manage the traffic flow through the town centre and that might look at something like widening pavements and where I am at the moment is seeing whether we think that's something we should go out and talk to residents about. If we think there's something that builds on the Olympics and looks good and doesn't divert traffic up residential streets then at least it might be worth consulting on while the memory is fresh in people's minds. Parking in Greenwich town centre car parks is quite expensive - just going over one hour would cost £5 because there's no 'part thereof' payment. Do you think the price of parking is an issue in Greenwich? I certainly think it's an issue. It's an issue across the borough in all of our town centres. It's something we're going to have to revisit and look at and see what's the right balance between trying to ensure that we can manage the financial challenges we have alongside bringing people in to our town centres. The price is due to go up to £2.70 an hour in Greenwich - will that price rise be going ahead as planned? If there's something planned in the system there's nothing we've done yet that would say it wouldn't. Returning to London 2012, what are the tangible legacies that residents and businesses can look forward to? Legacy means different things to different people. From the first person getting a job on the Olympic Park helping to build the stadium - we just had figures that show that of the Games Time jobs across the host boroughs, Greenwich and Newham have the same percentage and if you care to go in to the decimal points, you'll find we got seven more jobs than Newham, not that we're point-scoring! All of that is a legacy. The volunteering and the thousand people we had as volunteers which we're starting to use in other areas again. I think the planting of the 2012 trees, the green flag parks and so on, all of those things, the facilities at Thomas Tallis and Crown Woods schools. New sports equipment in to parks. We tried to do as much of that as possible because with thought this Autumn would be full of people asking, "where is the legacy?" and people complaining about the Games. We thought we'll deliver as much of the stuff as we can ahead of time. The legacy now is changing the nature of the tourism in the borough and building the tourism drivers such as the cruise terminal and making sure this becomes more of a leisure-based destination.We want people to stay over night, not come for 2 or 3 hours, then have a sandwich and coffee and disappear. You mentioned the cruise ship terminal - what's your most recent update on what's happening with that? The government has set up some new marine based quango which sits parallel to the PLA. Both organisations need to give licences. They're through the PLA bit and this new organisation also needs to give some kind of licence. In terms of a time frame, when would you expect to see progress? Depending on how long these licences take but they're ready to go once they have them so I would hope if it's not built and operable by this time next year, it will the first quarter of 2014. Moving from cruise ships to tall ships, did you learn much at the recent conference in Riga? We learnt a huge amount, we really did. They rotate the tall ships race but they have things like tall ship regatta which are smaller. We bid for 2016 for the tall ships race. We threw this together after the Olympics, I think we were almost beyond the qualifying period. We went out there and they offered us a 2014 regatta. They rotate the races between European regions and 2016 should be the Iberian peninsular. So we said to the Dutch guys we've been working with and who brought the tall ships here this summer and who suggested we should go for this, "why are we bidding for the race for the Iberian peninsular?" And they said, "Oh, there's issues" and there can't be any harm to put the bid in so we put the application in. We went to the conference and there was a report back from each of the host ports. So we got a sense of how different ports had done things. What we started to learn is that there's a shortage of bidding ports for 2016 and therefore there is the possibility of that race potentially being moved. I don't think they're in a position to say that yet but because of the nature of the recessions and austerity measures in Spain and Portugal, there's an issue I think for some of those ports and city mayors. There are other tensions with our arrival in this network of relatively small ports, who for them, this is the biggest thing they'll ever have. I suspect there may be a tension between them and the big tall ship captains. You can see the captains are really attracted by Greenwich and what it means to access to London for how they can market the corporate hospitality element. The arrival of London has been welcomed by the ship captains but you can see the smaller ports thinking, "the last thing we need in this is London." but the demand is being driven by the captains and some are saying we want to come on our own next year anyway. Did you learn anything about the economic benefit of being a host port? All the host ports had these DVDs and I dont think anyone came out with less than nine-to-one in terms of economic benefit to the outlay and some were more than that. Did anyone you spoke to raise any concerns about getting the largest tall ships under the Dartford Bridge? They all know about it. Some can take their masts off and some can't come but we met a guy who said he had the biggest tall ship in the world and he wants to come next year but he needs a berth like the cruise ship terminal. The council has launched a campaign called Bridge The Gap - can you explain the thinking behind it? Years ago before the mayor of London existed there was a proposal for what was called the package of three and the third was a rail link to the Woolwich. That one's been delivered and we continue to support the other two crossings. The reason for both is partially to ease some of the congestion but also in recognising the development opportunities that exist on the peninsula and in Charlton, in Woolwich and through to Thamesmead and on the other side of the river around the Royal Docks. If you're going to really promote employment and growth, then you need to maximise what you can get out of these brown field sites. The ability for goods and services to move between the two is crucial. About five years ago I was told from someone in Canary Wharf but there was not a single business south of the river that services the Canary Wharf estate. The reason for that was because anyone offering to clean an office, or whatever service, is that was would have to be able to get through the Blackwall tunnel. So our support has been consistent for the best part of 20 years on these crossings. Increasingly the jobs are being created on the other side of the river. We'll have some new jobs but we're never going to be self sufficient in employment or solve our own employment problem. Access to those jobs is crucial. Doesn't more roads mean more cars and more pollution? We've ummed and ahhed about the tolling but we do think tolling is a necessary. If that's the only way of getting them built then we'll support the tolling. Clearly with tolling comes the possibility of demand management. 85% of the traffic through Blackwall doesn't start in Greenwich so why can't that go over the Dartford Bridge? Why can't it go elsewhere? Well there is nowhere else to go so the prospect of more capacity, also with a bridge at Thamesmead, but also with a tolling system to manage demand. We'll make an argument about local access and whether local residents can cross for free. We are also making a case for Greenwich town centre and saying we want to understand the impact a tolling system would have upon the world Heritage site in terms of traffic through Greenwich if people seek to avoid tolls. Question from a Facebook user: what is the council doing to increase advice and support for people affected by changes in benefits, legal aid and especially people with disabilities and young people without family support? We are currently getting our head around the number of people we think will be affected by these changes to individual benefits. So we know that there's something like 400 families affected by the universal benefit. 122 of them will lose more than £100 a week. We are looking at the people affected by the bedroom tax where they get their benefit cut if they're under occupying. There is the council tax benefits scheme which the government is delegating to local authorities to implement from April 1st but doing so with a 10% cut. We're not allowed to cut the benefit for pensioners which is fine but does mean the cut for everyone else will be more like 15% than 10%. So what we're doing at the moment is trying to identify all these people and support them. We're talking to advice centres to see who's coming through their doors but most of these changes hit in April so we are building profiles and how we can assist. What's the status of Greenwich foot tunnel and is there enough money to complete it? There's still work to be done on both of the foot tunnels and we know that we need to secure people to do that work. We have appointed construction lawyers to understand what went wrong and where liabilities might be. There's an assessment going on as to what should be the proper allocation of responsibilities and liabilities. We appointed someone to do an independent look at other contracts just to see if the structures are in place to make sure there isn't anything like the foot tunnels happening elsewhere. He's not been asked to look at the tunnels until the lawyers have said who's to blame for which bits. In so far as there had been improvements, have they been worthwhile? Do you almost wish you'd never been given the money for the project? As I understand it, after about a hundred years there was certain work that needed to be done and in one sense we went through this with the Cutty Sark. There was a point at which you could just put it back together, as it was, or you could raise it and do what has been done with it. We decided to go with the iconic scheme with the Cutty Sark. I said, "if you just put back as it was you'll have spent £30 million and nobody will know what you spent it on other than having a state-of-the-art but original-looking rivet." With something like the Cutty Sark you can go the extra mile and raise the extra money and make it look like what it is. I think at the end of the day a tunnel's a tunnel but if there starts to be seepage as there was the main job is just to fix the tunnel and after a hundred years of pretty little maintenance, it's never going to be an artistic looking project. There was some support earlier in the year for a change back to the committee system at the council including a petition and also a motion from the Conservative group which was dropped at a council meeting. The political groups went away to consider this further - do you have an update on that? I think it was one particular Conservative member, from what I've been told, rather than the whole group. We have had a discussion. I have to say nobody spoke in favour of returning to the committee system and it was overwhelmingly defeated. I think the reason it was defeated was that people don't want to go back to that system. If people have a view of what they want the council to be, then simply saying let's go back to something that was very insular where all the committees are whipped so you wouldn't have a planning or licensing meeting where the councillors in the room weren't whipped. In my party's rules, it's against the constitution to whip the scrutiny panels but you would move to a system where everybody would be whipped in every committee. So there was a lot of opposition to it, particularly with people saying is this the right time to be doing this, mirroring the debate nationally as to whether this is the right time to change the electoral system or redraw the boundaries or reform the House of Lords when the country's got these debt problems. I could sit here and talk to you about these 400 families that are about to lose £100 a week or the other people about to get trampled all over by the benefit changes and the unemployment challenges we have. But to then say actually what Greenwich Council is now going to do is talk about its internal management? With regards to the town hall, it's a very nice building but sometimes it's hard to usefully attend meetings because of the poor acoustics in some rooms. Is it still fit for purpose? I think it might not work as well as it should but I think there would be a reluctance to get rid of the town hall although one of my councillors has advocated it. But I think we do need to spend some money on it and it's always this balance of "oh, you've got money to tart up the town hall whilst your closing this, that or the other." Although hopefully we're not closing this, that or the other. But the challenge in the current financial climate is to be seen to be spend money wisely. We do know that the acoustic system is something that needs to be looked at. Under the constitution, members of the public can't record a meeting. Is there a reason why they shouldn't be able to? I think it's just a discussion and debate we've never had so we have these current standing orders and rules. We need, probably, to have the discussion about are we fit for purpose in the social media world, I guess. When it comes to those discussions, do you have any thoughts yourself? Do you think it's a good thing if people are interested enough to want to record a meeting? I don't know, I'd want to give it some more thought. I haven't given it a great deal of thought in all honesty. If you talk about a planning meeting, if a councillor says something that's a stray word because they are not trained legal professionals, if you turn something down and a developer's lawyers have recorded it you might find that that stay sentence, that stray word from one councillor, does you in at an appeal. So I can see the upsides and the downsides but I don't particularly have a hugely strong view about it. Are you happy with the way the council engages with people through its meetings or does it need to do a better job? I think we try to do that more through the service elements, so engaging in the way in which people choose to organise themselves such as friends groups, tenants' groups, pensioner groups and young people. It's a lot stronger in those service related areas. You can always say we should have more people [at council meetings] but I'm reluctant to say to people this is how you should engage with the council as opposed to facilitating other ways. I'm keen to make sure we're engaging with people where they're demonstrating their levels of interest and where our services are touching upon them. One of the ways in which people get information from the council is through Greenwich Time. Do you think it will be around for the foreseeable future? Well I hope it is because I think it enables us to engage with their residents. When I listen to my peers talking on a London-wide basis they often talk about the information gap they have. We did look at the statutory guidance from the Government and we did go through it in a lot of detail and looked at the costings and the coverage of local newspapers and talked to them about where they do and where they don't deliver and there are great big holes in that, and there are great big holes particularly around council estates. I understand that because they're delivering to the demographic of their advertisers which is perfectly fine, they've got a business to run. But there is a real underreported element. There was a scam going on, and this was told to me by a Conservative Essex county councillor who said, when this debate was going on, that they tried to place an advertisement [in a local paper] as the county council and they were being charged an astronomical fee. Because it was something that bordered on being potentially party political, he said , they then did it as the Conservative Party instead and got it at a tenth of the rate. Because newspapers knew that notices had to be issued for traffic, for licences, for planning and various things, the charges that they would make to local authorities.... it was virtually a monopoly. What do you say to people who make the argument you get a political benefit from delivering your good news to people every week? I don't think we're classed as a newspaper but I'd happy to sign up to Leveson! But even if not overtly political, doesn't it seek to make people very comfortable with the status quo because it tells them all the positive side of the council's work. Isn't there a benefit, even if unintended? I don't think so, no. I think the public are far more intelligent than we give people credit for. If anyone has this debate it's the Labour Party, asking how would you ever get a Labour government with the national media we've got. Well, the fact is we did with two of the biggest majorities in British peacetime history at times when Rupert Murdoch was at his most vociferous. At a time when Labour nationally was not so popular, if that's fair to say, in 2010, you still managed to increase your number of councillors. In 2014, with the coalition parties carrying out austerity cuts, is there a chance that opposition on Greenwich Council will be weakened even further - is it important to have an opposition? You do need an opposition. You need a good opposition. Has it got a good opposition at the moment? I don't think they're as strong as they could be or should be. I don't particularly want to comment on why not but talking about 2010, there was certain things you could read from the 2006 results about where the threats were to Labour. So from 2006, absolutely nothing to do Greenwich Time, we set out to deal with what we could see were people's concerns. I think the one thing you would normally get from a Conservative opposition, perhaps, is they would attack us on financial competence and spending and the realities they haven't been able to do that despite that article you had [by Cllr Matt Clare on Greenwich.co.uk] which just beggared belief. 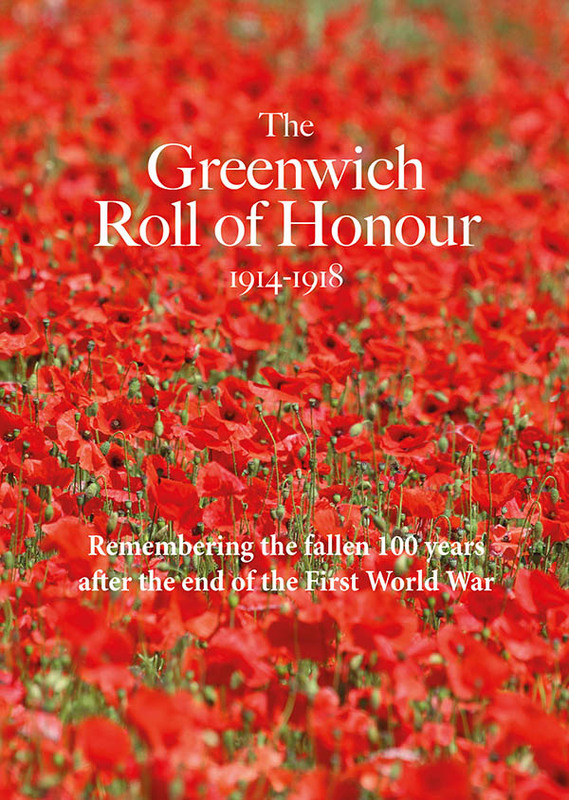 You're one of the longest serving leaders of Greenwich Council - probably the longest serving - and a lot has happened in that time. Are there still things you want to achieve as leader of the council. You always have things you want to do, there's never a feeling of "oh well, that's wrapped up". Things are running in parallel but if there's one thing I want to do in the next few months it's to nail the Crossrail station at Woolwich and resolve the finances of the fit out of the station. You can see that whatever the challenging times we've got, if you're going to regenerate Woolwich - and it's still the poorest area of the borough - it's the one thing that would make sure it happened. We would cease to be on the cusp and it would just generate so much interest. Do you have plans to go "on and on"? That's a phrase that will never cross my lips. Do you have political plans or ambitions outside of the council? Umm... No. I haven't got any. Like what? Maybe standing for parliament one day? It was suggested to me before the last election and I looked at it and I thought in all honesty I'd be bored. So you're happy doing what you're doing? I think that whatever I do in the future and however long this lasts, it's probably the best job I'll ever have. It's great - no two days are ever the same. You get to see things moving forward, you see people getting new jobs in Tesco and you know you had a hand in that. GLLAB in a sense was my baby before I became leader so it's great to see things like that take place. Thanks to Cllr Chris Roberts. GREENWICH town centre now has the most expensive council-run car parks in the whole of south London, research by Greenwich.co.uk has found. The council almost doubled charges in its three town centre car parks at Cutty Sark Gardens, Greenwich Park Row and Burney Street in 2011. Visitors now pay a minimum of £2.50 an hour to park. Councils in neighbouring Bexley and Lewisham charge just £1.00 and £1.40 respectively. Greenwich Council intends to raise its parking charges again to £2.70 an hour next year. Use of Greenwich town centre car parks has dropped by around 40% as a result of the new charges, with just 13% of visitors now coming into town by car. Visitors also spend far less than in other nearby town centres. A study by TfL found that people spend an average of just £20 per visit in Greenwich compared to £31 per visit to Woolwich, £33 per visit to Bexleyheath, £39 per visit to Bromley and £48 per visit to Croydon. Just 26% of those surveyed say that they come to Greenwich to shop. This is lower than any of the other 14 London town centres in the study. Our research found that it is now cheaper to park in parts of central London than Greenwich, with Southwark Council charging just £1.50 an hour for its car parks. Only one other council-run car park has a higher hourly charge in South London. Buckner Road car park in Brixton has an hourly charge of £3. However, unlike Greenwich, visitors are able to pay to park for less than one hour, with prices starting at just 20p. Research by the Conservative group on Greenwich Council found that the number of parking hours paid for in Greenwich town centre car parks dropped between 37 and 42 per cent since the charges were raised. Meanwhile parking revenues have only increased by relatively modest amounts. In Greenwich Park Row car park, the council have increased takings by just 10% despite raising charges by over 90%. Greenwich council admitted earlier this year that the new charges have raised less than half of the extra revenue they expected. “Raising parking charges in Greenwich has clearly reduced the number of people travelling to the town centre by car. Many people I speak to are actively choosing to go elsewhere as a result of the expense of parking in Greenwich, for example with many watching films in Bluewater rather than the wonderful Picture House because it costs an extra £10 to park in Burney Street as opposed to nothing out of town. "With the Olympics reducing car visits still further, the Council must not put charges up any more in 2013, as I think any potential gains in revenue from parking will be lost with lower business rates as shops lie empty." The latest census showed that car ownership has dramatically dropped in London over the past ten years, with many more people now using public transport. However, TfL found that fewer people use the bus to visit Greenwich than all but one other London town centre, with visitors highlighting “less traffic” as the main priority for improvement in the area. “Greenwich Town Centre is in a World Heritage Site and is one of London's biggest tourist destinations. We therefore have to very carefully manage parking within the town centre and part of this is to set charges accordingly. Parking charges within the town compare very reasonably with other key destinations in London. THE CABINET member responsible for car parking in the borough says current pricing is "reasonable." Cllr Denise Hyland was answering a question from Conservative Deputy Leader Alex Wilson at Wednesday's full council meeting, who wanted to know if she agreed with a Labour MP's recent warning on the price of car parking. He asked: "Does she agree with Labour MP David Crausby, in relation to car parking charges, that if local authorities charge excessively for car parking within high streets and town centres, town centres are going to continue to die?" Cllr Hyland began her reply by referring to Westminster Council. "Well, I’m not taking any lessons from Westminster [council] that’s for certain where the Leader had to resign over the fiasco there and the Cabinet Member has now been shifted sideways, Mr Mayor." She continued: "There’s always a balance, isn’t there. Everybody wants controls, everybody wants enforcement, nobody particularly wants to pay for it and the only way that we can fund enforcement is actually through levying a reasonable charge and if that’s what you wanted to hear from me about reasonableness, that’s what you will hear from this side of the Chamber around all issues including car parking." The council ramped up the price of parking at its Greenwich town centre car parks from £1.30 per hour to £2.50 per hour last year. Greenwich.co.uk revealed last October that the big price hike was delivering only a modest increase in revenue. A further increase to £2.70 per hour is planned for next year. Greenwich Council has been accused of "literally driving people out of the area" after it was revealed that significantly fewer people are now using town centre car parks, following big increases to parking charges. Last year the cost of parking in Greenwich town centre was almost doubled from £1.30 to £2.50 an hour. Parking permits and on-street parking charges were also dramatically increased in an attempt to make an extra £1.1 million a year. However, last week officers told the Overview and Scrutiny Committee that the council had actually netted less than half this amount. They claimed that this was mostly due to delays in implementing new charges in Eltham and Old Dover Road. However officers admitted that the number of tickets sold at off street car parks was also significantly down from previous years, suggesting that the increased charges are keeping people away. The council intends to raise charges even further to £2.70 an hour next year. "If you increase charges to this extent then you are going to literally drive people out of the area. They will happily pay a pound extra in petrol to drive somewhere like Bluewater because they can park there for free. And one of the things about it is that you have to pay for a whole hour, so if you want to stay for an hour and 15 minutes then that's £5.00. That has to have an impact." Wilson warned that the Council may end up actually losing revenue overall, when government plans to give local authorities 50% of business rates go through. Officers said that they have not conducted any studies into the impact of the increases on local businesses. However, they insist that many shoppers may simply be using public transport instead. Figures released to this website last year showed that the council had made only modest increases in revenue following the increases. The figures released last week show that increased charges for off street parking raised the council just £71k extra last year, half of what they had expected. The council believes that expected parking revenue could fall further once the huge new Tesco development is completed in Woolwich later this year. The committee were also told that increases to parking permit costs may be causing more residents to pave over their front gardens. Officers warned that this could increase the risk of flooding in some areas. More and more people are dumping large items like mattresses and sofas in their front gardens, following sharp increases in collection charges. "I've noticed an increase not only in fly tipping but also in the number of residents who are leaving these items in their front gardens and not having them collected and some parts of my ward it is quite an eyesore. And maybe what we could go away and consider is the environmental impact, because you're talking about an increased number of people who are all going to community sites rather than one van going around and collecting these items." "Big concerns were raised at the time that whatever we raised from extra charges might be offset in other ways by additional fly tipping but we were in a position where we had to make x amount of savings and really what's happened is for members need to bare in mind when we consider increasing charges in future." Is Greenwich Council's 92% price rise at town centre car parks driving visitors away? Greenwich.co.uk investigates the impact of the parking price rise. BIG increases in the cost of parking in Greenwich have delivered only modest increases in revenue for the council, Greenwich.co.uk today reveals. Despite almost doubling the price per hour at the town centre's pay and display car parks, revenue increases as a percentage are far lower and in some months, the car parks have generated LESS revenue than at the same time last year. The cost per hour at the town centre's pay and display car parks was put up from £1.30 an hour to £2.50 an hour in April this year - a rise of 92%. But figures disclosed through a Freedom of Information request show that income was up at Cutty Sark Gardens car park by an average of just 14% between May and August compared with the previous year. During the same period at Burney Street, revenue went up by only 7.2% on average. The disparity between price increase and revenue increase suggests that less people are using the town centre car parks since the price rocketed in April, or they are staying for shorter periods. Leader of Greenwich Conservatives, Councillor Spencer Drury, is worried about the impact the price hike is having on Greenwich town centre. "The Council think that extra parking charges will bring in extra revenue but these figures and the increasing number of empty parking spaces around Greenwich suggest that this is simply not the case. Having spoken with firms in Greenwich I know that they think that the increase in parking charges has damaged their business. So the Council is achieving a double whammy of lower revenue than they need combined with closing down small firms in Greenwich. "It is rank stupidity to continue to pursue these increased charges when they are not raising extra revenue and are damaging our town centres. As an Eltham Councillor I am already collecting signatures on a petition against the charges being implemented here, where they risk doing untold damage to our High Street." "A price rise of 92% may at first appear to be counter productive however the evidence suggests that given the lack of other parking options in the town centre and the need for parking by a growing number of workers and students in the area, it results in a modest rise in revenue for the council. "In addition it is likely to have increased the revenue to the council from parking tickets issued for overstaying purchased tickets as visitors attempt to moderate the cost of the parking by buying fewer hours at the cost of the local businesses in the area." Greenwich.co.uk asked Greenwich Council if they would be reviewing the impact the price rise has had on visitors to Greenwich town centre but they didn't respond. Greenwich residents face a 150% increase in the cost of car parking permits next year and visitors to the town centre could pay almost twice as much to park. The large increases in the cost of car parking are part of a package of cost saving and revenue raising measures put together by council officers in response to budget cuts imposed by the Government. The proposals would see the cost of a yearly resident car parking permit rise from £27.70 to £70 - a rise of over 152%. A further rise would come into effect in 2013 taking the cost to £84 per year. Business parking permits face a 358% increase, leaping from £24.00 to £110 and then rising again to £132 in 2013. 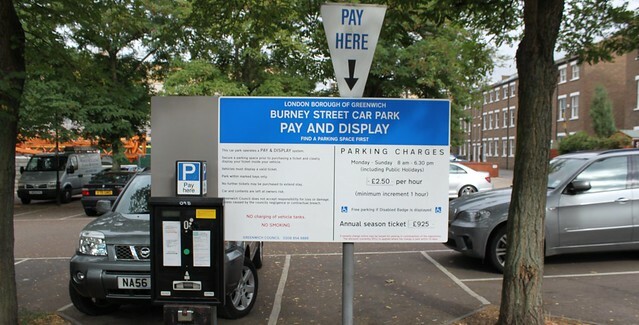 Town centre parking is set to rise by 92% with the price per hour at Burney Street, Greenwich Park Row and Cutty Sark Gardens car parks going from £1.30 an hour to £2.50, and then rising again to £2.70 per hour by 2013. The cost of parking in metered pays in road adjacent to Greenwich Park, such as Maze Hill, Park Row and Park Vista, will also rise to £2.50 and then again to £2.90 per hour in 2014. The cost of parking in the park itself increased this year to bring it into line with local authority charging but a spokesperson for Royal Parks has told Greenwich.co.uk that "Royal Parks currently has no plans to increase parking charges in Greenwich Park." New charging areas would be established in East Greenwich and Westcombe, as well as elsewhere in the borough, although council officers say that "detailed consultation will be required" and that a review would take place after six months. The new charges are expected to come into force on April 1st, 2011. Taken as a whole, the council believes that the changes will bring in almost £2million in additional revenue a year by 2013 which would be used to "contribute additional revenue towards the cost of the parking service and enforcement operations and other transport related activities."